I promise, it tastes MUCH better than it sounds! Yes, there's a reason there is a piece missing. :) I just didn't quite understand that this cake was for my friend Kate (who broke her arm...see yesterday's post) and her family. I just had to have a taste and MaMa was trying to get everything ready to take to Kate's house, so she gave me a piece to keep me busy while she finished up in the kitchen and got everything loaded into the car. It was a good distraction, because it was delicious. It kept me busy for at least 10 minutes, which is saying a lot for a two year old. You otta try this one. MaMa says that it is easy to make and it tastes delicious. It is my DaDa's favorite cake and he asks for MaMa to make it each year for his birthday. 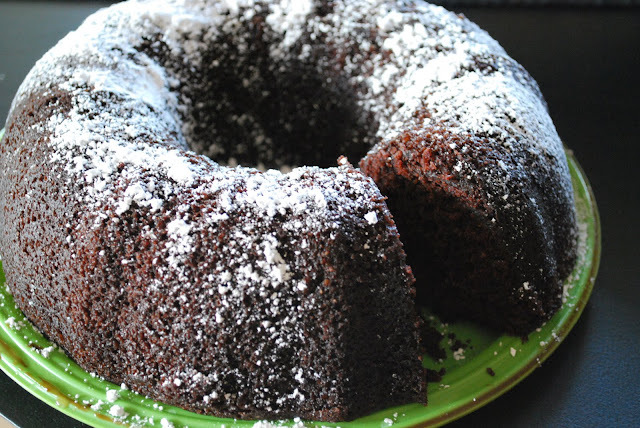 Mix all of the ingredients together, place in a non-stick bundt pan and bake for 40 minutes.